Hand harvesting of Fleur de Sel 100% natural and harvested daily by the Marenotos, this pure fleur de sel retains natural humidity and natural sea salt flavors. Harvested directly from the ocean, it undergoes no industrialized processing prior to being packaged. This is much better than French Fleur de Sel, as due to the rarity of rain in the Algarve, you will always get a pure white salt, in it's highest purity, not possibly achieved by the french, due to the rains that bring small debris that are absorbed by the salt and you can see a grey toning. Fleur de Sel, a unique gourmet treat that French chefs have brought to market. In the old days, this kind of salt was collected by the workers for their home consumption. They called it salt cream, as it is collected from the pan surface as cream from the milk. 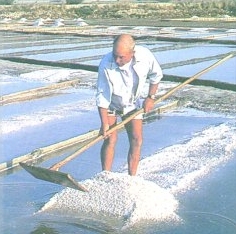 This kind of salt is harvested by hand every day it crystallizes at the water surface. 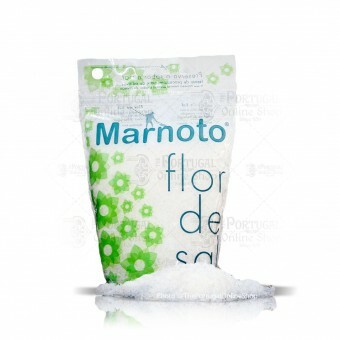 It is the best salt one could find, as it contains a splendid blend of trace minerals. 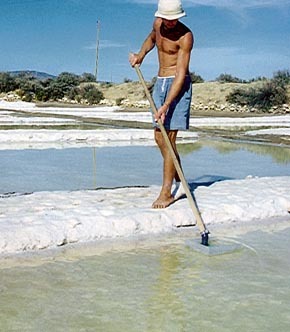 Day by day, the marnoto patiently harvest the thin layer of salt that lays on the water surface. It is a very hard work, but worthwhile, as the exceptional quality of the product cannot be matched by any other salt. Fleur de sel is the ideal product for demanding gourmets. It has an unique bouquet that naturally highlights food flavours and naturally enhances aromas. It crumbles easily when rubbed by the fingers. It is the ideal salt to go to the table, it has a unique touch, it is as fine, pure and white as sea salt must be. 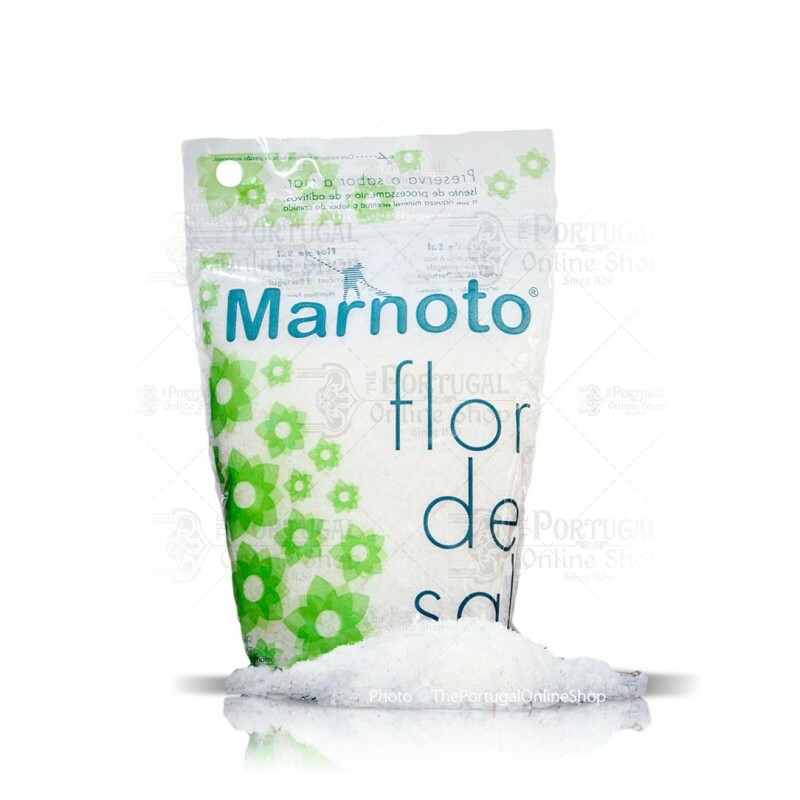 Necton’s flor de sal is the recipient of the Slow Food Award and is certified by the French environmental organization "Nature et Progres" to be free of the industrial contaminants sometimes found in mechanically harvested sea salt. Necton receiwed the Slow Food Award for the Defense of Biodiversity. With this price, outstanding achievments in the field of Ecology and Preservation of Biodiversity are recognized. Ok, so whats the difference between pure Fleur de Sel, Seasalt and ordinary salt? to put it plain and simple, Fleur de Sel is the most pure type of salt you'll ever eat. It has no processing whatsoever, its goes straight to package right after being harvested! It's composition it's the purest close to seawater and it possesses almost all nutrients seawater has, with all it's rich and healthy properties! Oh...did we forget to mention the unique taste? Yeah that's right. Fleur de Sel is unforgettable. No other salt can compare to this. Go on, try it! You'll never want to cook with any other salt. Call us on skype for some unique Portuguese recipes from delicious tender fish, to succulent grilled meat along with tasty Mediterranean salads. It's the perfect seasoning! Top quality salt - Thank you for sending us for approval. 9/10 for purity, being 10 pure sea water. Here at Salt Review Mag we are eager to try some Portuguese recipes to use this super good salt! We'll keep buying! Keep up the excellent service!